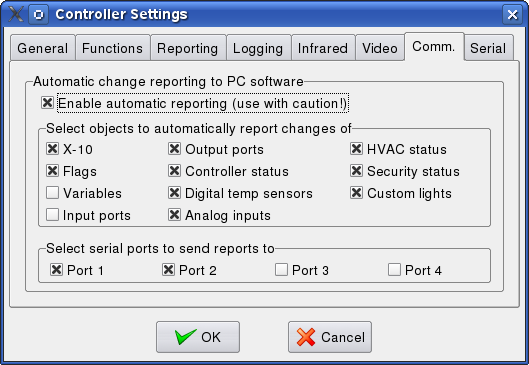 A number of HomeVisionXL plug-ins present information in one form or another based on the value of Homevision objects, like variables, X-10 modules, or input ports. To be able to give accurate information, these plug-ins need to be informed about any relevant changes to the value of the objects as soon as possible. For this, the plug-ins rely on the automatic reporting feature of the Homevision controller. After configuring these options, the schedule has to be reloaded for the changes to take effect. Note: The HVAC status report, the Security status report, and the Custom lights update report are only available for a HV-Pro controller with a recent PROM (3.44 betas or higher). When you have figured out the best settings for your schedule, don't forget to copy them to the Comm tab of the Controller Settings screen. That way the settings will still be correct after the next download of the schedule. An appropriate place would be inside each action that changes the interesting object, or perhaps in a timer that runs every couple of seconds. When one of the above commands is encountered in a schedule, the report is not created immediately. Instead all requests for reports are collected and processed at the end of the event loop. A report for each object type will only be generated at most once per loop. So you don't need to write complicated code to prevent multiple reports. If you have an action with two if's that may each modify a different variable, you can just add the report command in both if bodies. Also, if an action calls a macro that changes a variable, it is fine if both the initial action and the macro contain a report command for variables.